I am indebted to Percival Devante Esq for the following item found on the now defunct (great word to be looked at later) blog site Swell & Dandy. It’s such a shame things must come to an end! Set in 1930s England and America, P.G. 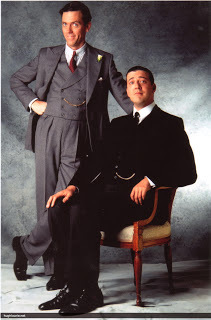 Wodehouse’s ‘Jeeves’ stories in addition to the television series based on the former are riddled with charming, archaic English terminology and phrases. If you don’t know the stories, you really are missing out. Delay no longer and get the books here. Or, view the series with Hugh Laurie and Stephen Fry here. The following is a list of essentials with their definitions and explanations. Feel free to slip them into every-day conversation to keep your friends on their toes. Chap – (n) A man or a boy. Pipped – (adj) To get the better of; defeat. Not added to the Word List. This entry was posted in All, Jeeves on February 28, 2015 by Adrian.